GoFormz Workflow Automation is a powerful tool that lets you set up form actions that happen automatically based on certain triggers. For example, you may want to send an email to the customer whenever a form is completed. In this case, form completion is the trigger, and emailing the customer is the action. This article goes over how to set up a new workflow automation or edit an existing one for both the template and recipe workflow models. See here for more about workflow automations and the difference between the two models. Workflow automation is set up in the Template Events window. To open this window, navigate to the Templates Tab and click the name of the desired form template to open it in the Template Editor. Then click the Manage Events link at the top of the editor to open the Manage Template Events window. To create a new event, click the Add Trigger button at the top of the window. To edit an existing event, just click on the desired event in the Triggers In-Use section at the top. As the name implies, triggers initiate the workflow. Triggers are set under the When this happens section in the middle of the Manage Template Events window. There are two key components to the trigger — who does it (User dropdown) and what they do (Trigger dropdown). In the User dropdown, select who can trigger the event. This can be an individual user (e.g. Jane Doe), or a user group (e.g. Field Techs). Select “Anyone” if you want to allow any user in your GoFormz account to trigger the event. 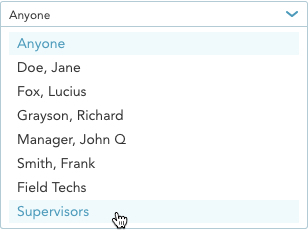 In this example, we’ve selected the Supervisors user group. a. Completes form: When the user clicks the Complete button on a form. When this trigger is selected, an additional checkbox appears that reads Do not run again after form has been reopened. When the box is checked, the event will only happen the first time that a form is completed — it will not happen again if the form is reopened and completed again. One use case for this is events that email a customer — you probably want to email the customer just once, rather than spamming them each time someone reopens and re-completes the form. When the box is not checked, the event will happen every time the form is completed. A use case for this is saving the form to Box — you will generally want to do this each time the form is completed, to make sure you have the very latest version of your form in Box. b. Receives a transferred form: When the user receives a form via a form transfer. c. Has a public form submitted: When a Public Share form is submitted for a form owned by the user. In this example, we’ve selected Completes form. So this event will be triggered when a user in the Supervisors group completes a form that was created from this template. The next step is to select the action that is initiated by the trigger. In this example — what happens when a user in the Supervisors group completes a form created from this template? The action can be selected from the dropdown under Do the following toward the bottom of the window. In this example, we selected the “Email” action. Note that you will not see the “Save to Box” action unless the Box integration has been activated in your account. Click the Save Changes button at the bottom of the window to save your template events. Navigate to the Workflow Tab. Click the Add New button in the upper right. The Add Workflow dialog will appear. Choose the desired recipe from the Workflow Recipe dropdown. The list of recipes that appears in this dropdown is determined by which app connections you have set up. 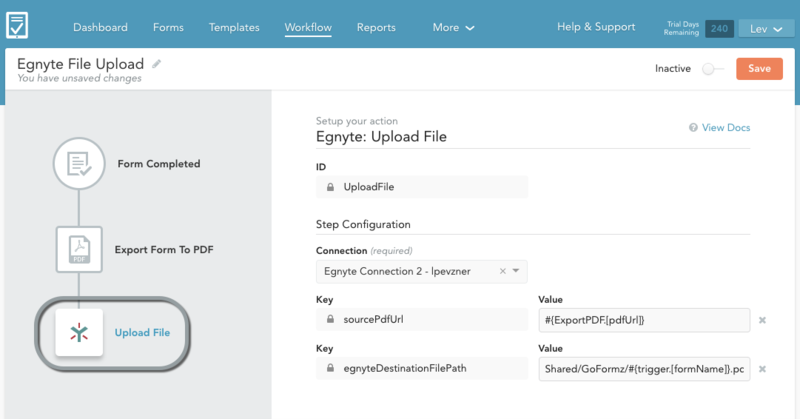 In the example below, the Egnyte File Upload recipe option appears in the dropdown because an Egnyte app connection exists in this account. Click Next after selecting your recipe to load the recipe steps. The first step in a recipe is always the trigger. The example below shows a typical recipe that consists of three steps — a trigger (Form Completed) and two actions (Export Form to PDF and Upload File). The trigger options will vary depending on what the trigger is. Make sure to configure all trigger options before clicking Next. 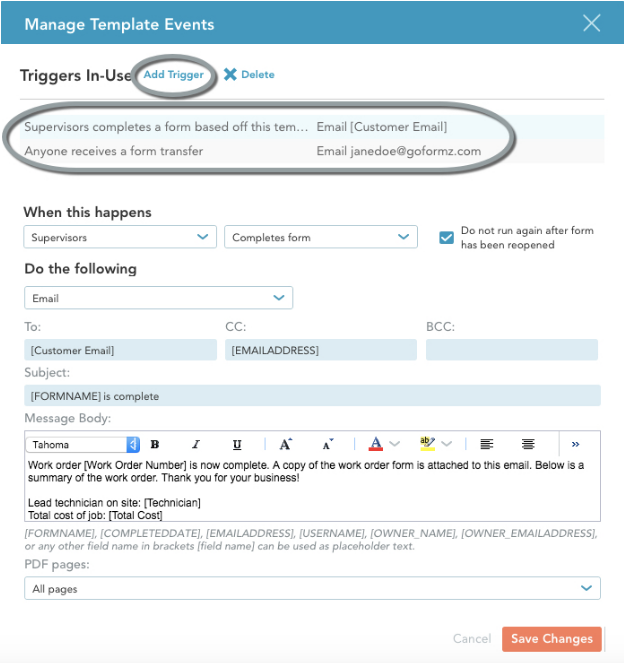 In this example, we have selected a form template; the trigger will activate whenever a form based on this template is completed. Next, you must set up your workflow actions. A workflow may have a single action or several actions. Each action has an ID and a set of configuration fields and/or key-value pairs for you to configure. Fill in the configuration fields and the value section of the key-value pairs. You may use an action step’s ID to reference it in subsequent action steps. The sourcePdfUrl value contains a reference to the previous step (ExportPDF), and grabs the pdfUrl variable from that step. The egnyteDestinationFilePath value references the trigger, and grabs the formName from that trigger. See here for more about workflow variables. Step 5. Save and optionally activate your workflow. By default, a new workflow is inactive. If you want to activate it, click the Inactive slider in the top right to change it to Active. Finally, click Save in the top right to create your new workflow. The workflows list will reload, with your new workflow in it.